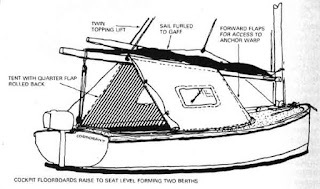 Once again, I’m grateful to a follower of this blog for pointing me to a small sailboat website, namely that of Liz Baker’s Cormorant sailing dinghy pages. 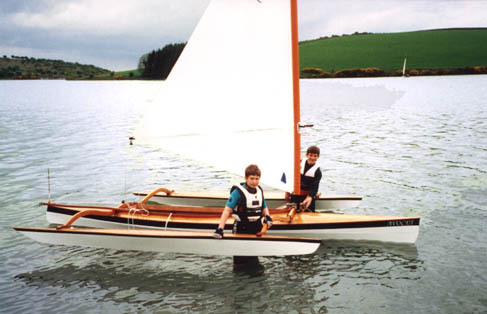 * She is a longstanding member of the Dinghy Cruising Association who has organised many or their South Coast gatherings. 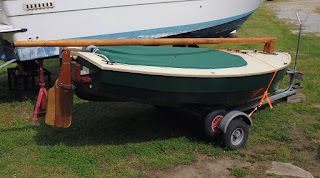 She has owned and cruised a Cormorant dinghy for a number of years, during which time she has learnt a great deal about getting the best out of her little boat. 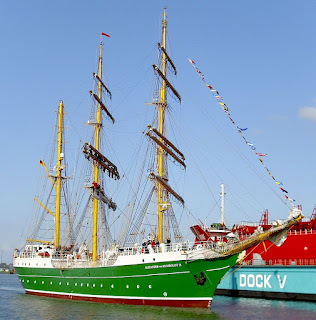 You can learn a lot by reading what she has to say on the topics of cruising, launching, recovering, rigging, reefing and camping aboard her little boat. 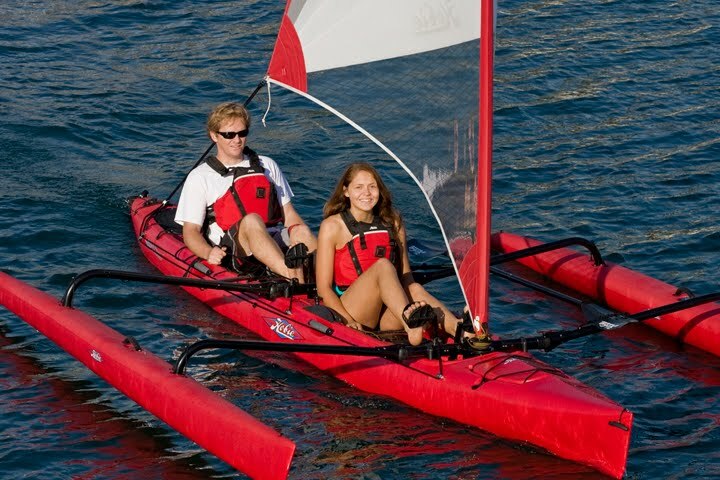 Getting a Little Dinghy or a Little Dingy? There are a number of ‘silly’ seasons throughout the year, and we are soon approaching one - the Festive Season, known by some as Christmas, and by others, as Yule, or Yuletide. It’s a time when people go bonkers - a time of mass hypnosis, when millions are compelled to buy gifts for one another. No matter how hard they try to evade the irresistible compulsion, they fail. Willing participants of hypnosis, we can be sucked in by commercial media, subliminal images, and tempting TV advertisements that are made more compelling by the inclusion of seductive soundbites. We scratch our heads and ponder what gifts to give. It is easy to succumb, but some recipients are impossible cases. Despite being hypnotised, we can think of nothing that can be be of use to them, because they have everything. Instead, for men, we offer them socks, slippers or pyjamas, and for women, we give them vanity cases, chiffon scarfs, mascaras and Boots vouchers! Christmas morning dawns, and children go mad. Santa Claus is quickly forgotten. They tear open parcels, create chaos, shriek with pleasure, or turn up their noses because they are discontented with what they have. Then it’s time for the adults. They feel or shake their wrapped gifts in the hope of guessing their nature. Slowly and carefully they remove the packaging to reveal the truth. When it’s not what they had hoped, they find it hard to conceal their disappointment. They flounder for words when they gaze at their ninth pair of gloves, their tenth bottle of bubblebath and their fifth packet of deodorant. They force false smiles of satisfaction, or on rare occasions beam with evident joy, because a useful gift has been given, or it is an article of real quality matching their taste. Last Christmas I held a wrapped gift, the nature of which I tried to ascertain by feeling and gently shaking it. I correctly deduced that whatever it was, was contained within a small cardboard box. Firstly, I removed the wrapping paper, then I opened the lid. Inside there was a bone china mug that had been manufactured for Nauticalia of London. Made for a right-handed person, it had to the left of the handle, a sepia coloured transfer portraying a dinghy being sailed at sunset. Above this symbolic image representing the end of the day, (and perhaps the end of life) were the words, Good Sailors never grow old, and below it, they just get a little dinghy. The more I pondered these words, it dawned on me, they contained a mischievous pun. Instead of reading, ‘they just get a little dinghy’, the last word became ‘dingy’, which according to the Oxford dictionary means ‘gloomy and drab’. There could be a truism in it. Therefore, every time I drink from the mug, I am reminded that I should smile, and thank God for what His Son has done for me. Though I shall die, I shall never grow old - despite the fact that I have a dinghy! I am convinced that there are few dinghy cruising sailors who would willingly undertake open sea passages of this nature. Without a doubt, the majority prefer camp-cruising on rivers, lakes, lochs, and estuaries, but some like coastal cruising, which can be a bit more adventurous. On occasions, any camp cruising can become challenging enough when the unexpected happens, perhaps a turn of the weather bringing fog, or a change of wind direction, or stronger winds than forecast, or even calms. Yachting is a very broad church. Those who take part in this sport are diverse, ranging from the loner who choses his particular modus operandi, perhaps sailing a ditch-crawler PD (Puddle Duck) Gorfnik,* to the highly competitive, super-human, who can only be satisfied by racing the latest high-tech yacht, to boot, around the world. In between, there are dinghy sailors who race or cruise, yachtsmen and yachtswomen who love pottering, day sailing, and cruising, and those who engage in a host of other sailing activities, involving both amateurs and professionals alike. 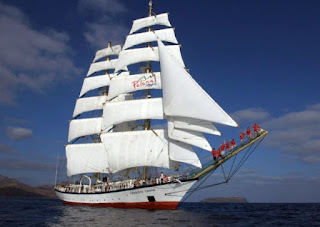 The Clipper Round the World Yacht Race attracts people who want to be tested to the limits of their endurance, and yet, according to the organisers, they are,‘ordinary, everyday people’. They say there is no need for a background of sailing - applicants must have a desire to join a group adventure, and be part of a highly competitive team who will face difficult and very testing conditions as they race around the world aboard a purpose-built 70’ yacht. There is a vigorous training programme for potential participants who can elect to join one or more legs of the race - or even race all the way round the world. Twelve, virtually identical yachts, are skippered by competent professional sailors whose task, along with specialists at the outset, is to train and prepare crews for their arduous adventure. Having been trained, the yachts and their crews are tested by competing in a six day offshore race before taking part in the real thing. 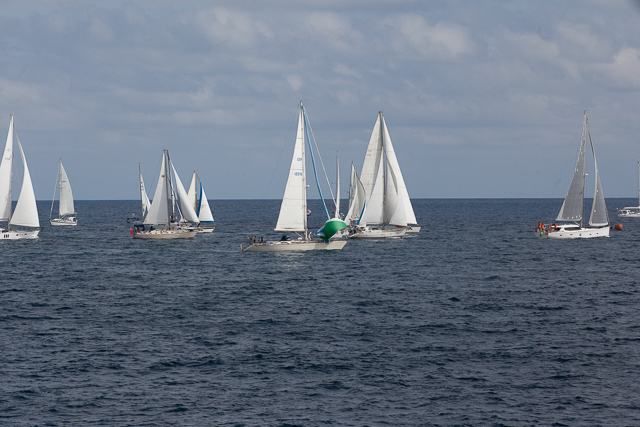 Commitment, strength, endurance and team spirit are essential, not just to win, but to bring yachts home safely. There are point penalties for loss of gear, sails, and damage to equipment; therefore skippers and watch leaders have to ensure their yachts are being sailed without taking undue risks. 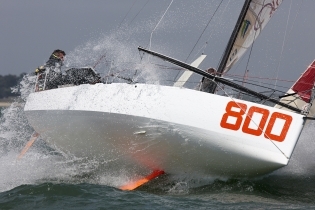 Sadly, shortly after the start of his year’s race, a yachtsman, Andrew Ashman, aboard CV 21, was fatally injured. This was the first and only fatality since the inception of the Race in 1995. The Race is not without risk. As I write, the leading yacht of leg 3, LMAX Exchange, is only a few hours away from the Wardan Whip finish line, SW Australia. 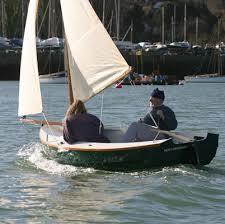 Because of my blog there are a number of people who email me telling of their experiences with small sailing boats. Some also seek advice or offer theirs. Now and again they refer to websites containing pertinent information. A few readers of the blog have become Cyberspace friends, and because of our shared boating interests we have met in person for further discussion. 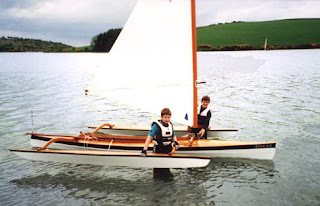 A couple of days ago I was replying to an email on the subject of converting sailing dinghies into trimarans, and the thought occurred to me that readers of the blog may also be interested; therefore I’m reproducing a highly amended version here, along with added links to trimaran websites. 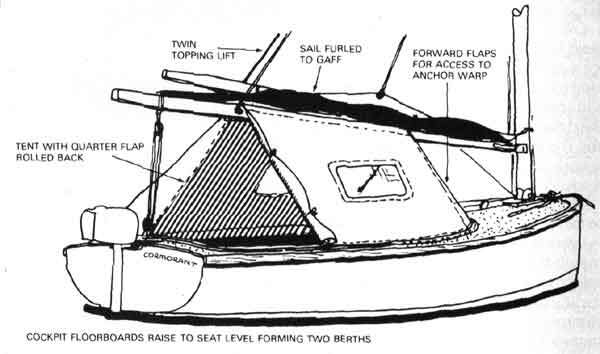 A thing that concerns me about sailing my Pike skiff is the possibility of capsizing her. With my condition of Raynaud’s disease, capsizing could prove fatal, but it is a risk I take. Converting her into a trimaran by adding cross-beams and amas would reduce the chances of her capsizing. In practice, fitting cross-beams and amas prior to launching, and removing them after afterwards, would take a fair amount of time. I would also have to transport them to and from the launching site. As it is, I find ‘Pike’ almost more than enough to launch, because she is nose-heavy on her launching trolley. For these reasons I have dismissed the idea of converting her into a trimaran. As I see it, there are two advantages trimarans have over monohulls: 1 They are usually more stable, and 2, They are often faster. 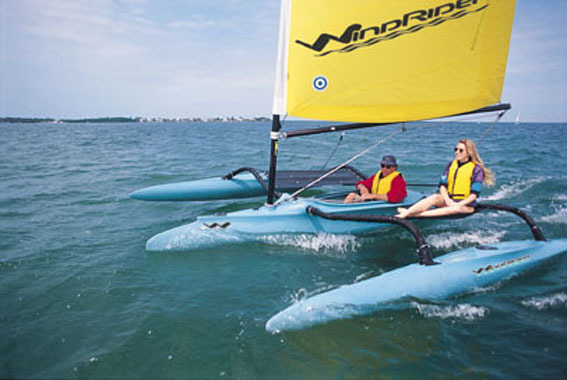 Their disadvantages, especially if they are trailer-sailers, are: 1 Setting them up at the launching site - off or on the water. 2 Coming alongside and mooring to a pontoon or jetty is not easy. 3 Unless they have stable trampolines or decks, getting on or off when moored to a jetty or a pontoon can be problematical. 4 They are not as handy as monohulls for sailing between boats on moorings and when there are tight situations, such as marinas and narrow rivers or canals. Trimarans are generally better kept on permanent moorings, and they come into their own when sailing on open water. They are speedy passage makers. I’ve never owned one, but I wish I had. 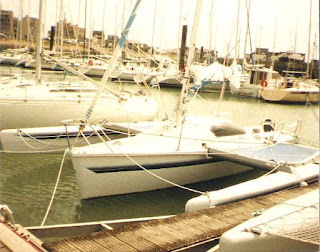 When I was cruising the Bay of Biscay with my friend Bill, aboard his Eventide 26, I was invited to sail an Edel 22* trimaran. She was tremendously exciting, on account of her speed, but very tricky to manoeuvre in the marina - even when being propelled by her outboard. This was not just because of her wide beam, but because of wind drift. 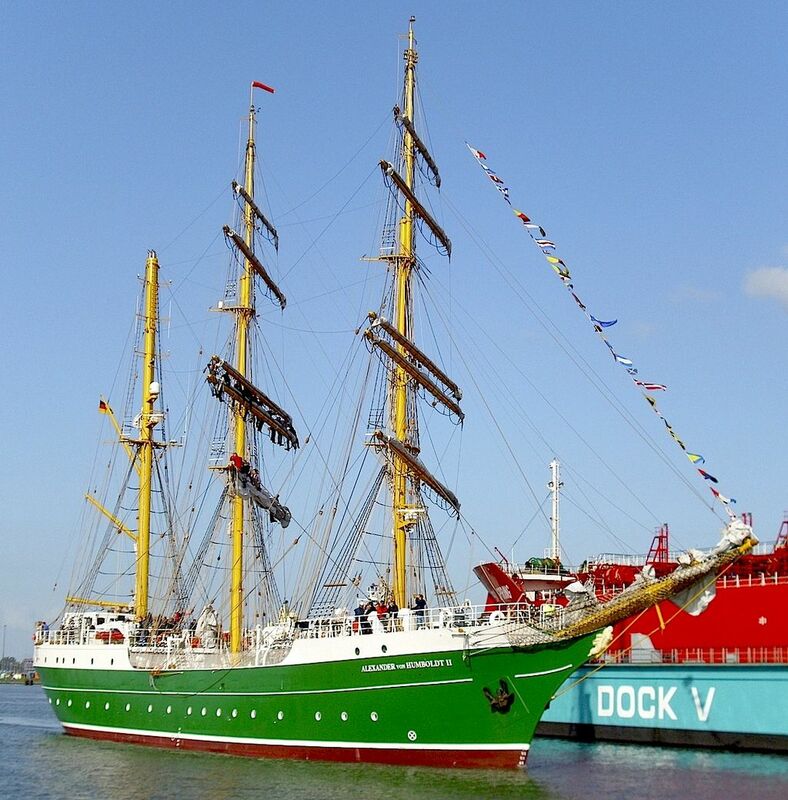 Below, you’ll find a number of links to articles referring to the Edel 22 and other small trimarans. Which Windrider is Right for You? Wouldn’t it be great to find yourself aboard a Volvo Ocean 65 racing yacht on a fine summer’s day for a jolly on the Solent! You have been invited to spend a few hours with the crew of Team Brunel. 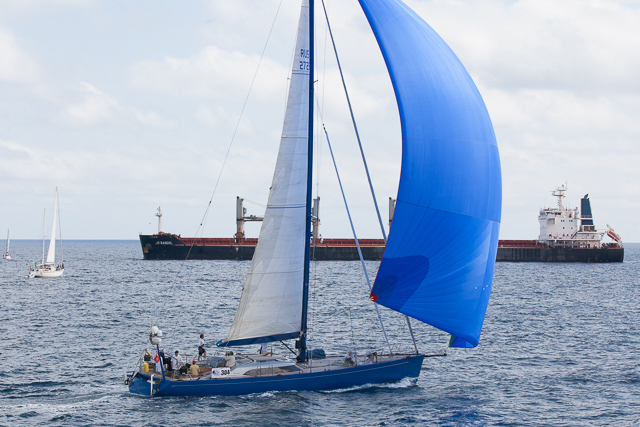 She came second overall in the 2014-15 Volvo Ocean Race series. 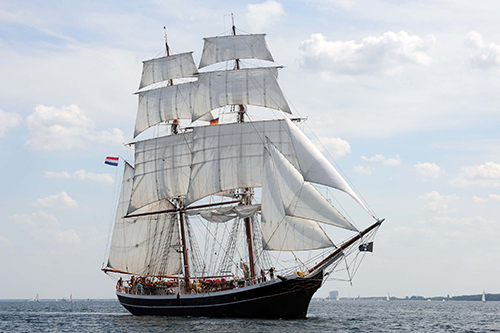 Veteran sailor and skipper, Bouwe Bekking, shakes your hand and introduces you to the crew. 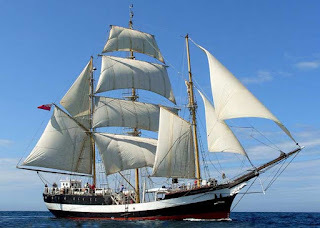 You are shown around the boat and briefed as to the schedule and emergency procedures in the event of something untoward happening - not that it was likely, but you never know - the yacht draws 4.7 metres, sails very fast (can average of 22 knots over 24 hours), and there are a number of hazards, both under the water and on it. The yacht gets underway. 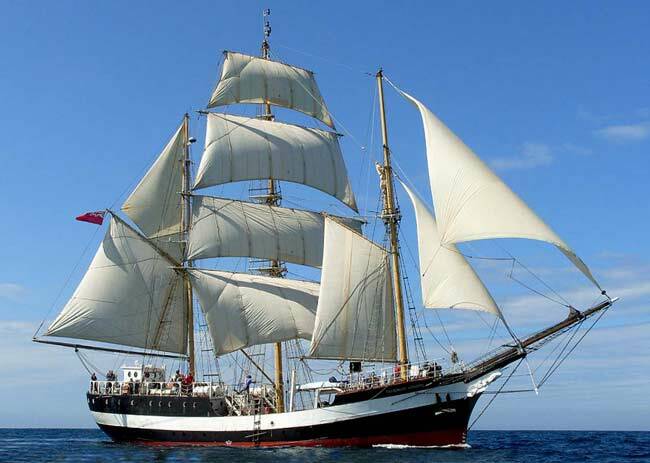 Sail is made, and she inclines to the wind as you leave Cowes en route for the Needles Channel. Only then do you imagine yourself racing day after day, being soaked to the skin, cold and very tired. You imagine being swept off your feet by a gigantic wave, and the only reason you did not end up in the drink was because you remembered to attach your safety harness. Thankful that your watch has ended, you go below and try to regain your circulation. You try getting some rest, but the noise and movement does not allow you to sleep. Then you think of your family at home and wish you were there. Instead, you find yourself retching and you have this awful pain in the pit of your stomach. You wish the world would come to an end. All of a sudden you look around, and there ahead is the Needles lighthouse. The sun is shining. All is fine; all is well. At the end of the day after sailing around the Island and returning to Cowes, you thank the team for their hospitality. You admire them for their achievement, and wonder how they did it. They are made of sterner stuff than you. What happened in Paris on Friday, 13th November, 2015, has affected people throughout the world. It is a time of great grief and mourning. The accompanying photo is of my local war memorial. Tied to it, there is a bunch of red carnations and a note with the words, ‘France, You are Not Alone, We feel Your Pain X’. This small token of love expressing solidarity with those left behind after the slaughter of innocents is a poignant statement. The memorial and the poppies remind us of those who sacrificed their lives for our freedom, and the carnations confirm we have that freedom. As far as I am concerned, this is madness, but a huge amount of fun. Racing brings out the good and the bad, but if the America’s Cup Series is won by following the rules, there can be no argument. I’m biased towards Ben Ainslie and his team. I don’t believe in luck, but when a coin is spun for heads or tails, there’s a theoretical fifty percent chance that it will end up the side chosen. If this occurs more times than not for the caller, he is said to be lucky. In truth, luck does not have a bearing. Uncontrolled variables come into the equation, such as the height of the spin, the force applied to the spin, and what side of the coin is uppermost at the start. If flipped or spun by a machine the chances of being 50/50 become more even by eliminating human inconsistency. Skill is one thing and chance is another. Chance isn’t the same a so-called luck. To win the Cup, Ben and his team will need to be skilful and perhaps make the best of their chances! Today, Friday, 13th November, Frédéric Denis racing his Proto Nautipark crossed the finish line at Point-à-Pitre, IIles de Guadeloupe, to win this year’s Mini Transat. 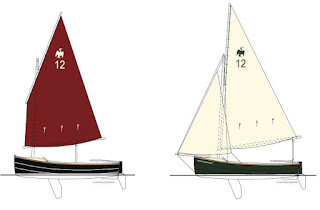 He was well ahead of Axel Tréhin, sailing Aleph Racing, currently in 5th position. 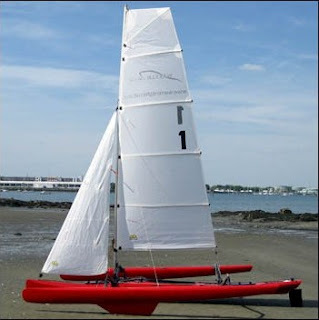 Remarkably, Nautipark’s average speed was 10.52 knots over an actual logged distance of 3,230.79 nautical miles, 450 miles more than the theoretical distance. It looks as though Michele Zambelli or Luke Berry will take second place. They are neck and neck with 16 miles to go. Nikki Curwen is in 11th place, and Lizzy Foreman in a Series boat is currently 30th out of 43 still racing in the Series race; she has 570 miles to go. 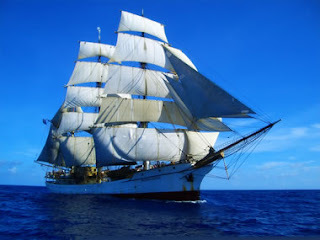 What exactly constitutes a tall ship? The first two websites in the Links section will provide the answer. 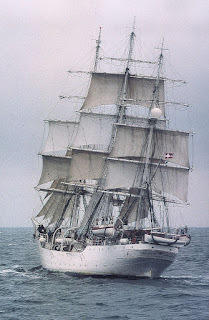 You might think that these sailing vessels of a bygone age would be of little interest today, but you would be wrong. Visit sites below for a flavour of what’s going on. Here are a number of links that will take you to websites about this year’s Atlantic Rally for Cruisers (ARC). 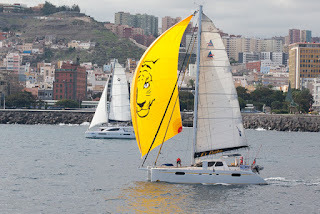 On Sunday, 8th November, over 60 yachts set sail from Gran Canaria for the Cape Verdes on the first stage of a 2,700 nautical mile voyage to St Lucia. 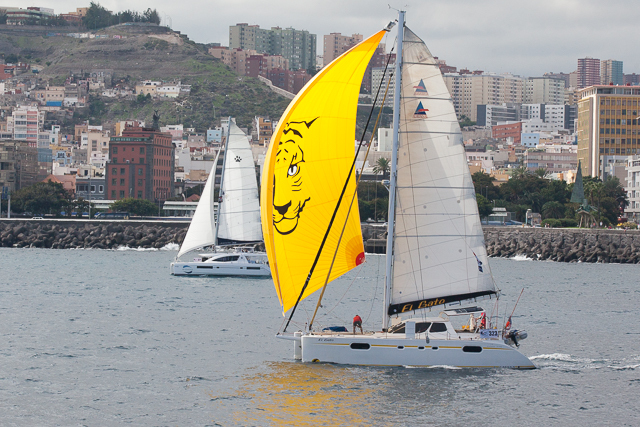 Over 200 more yachts will depart from Gran Canaria on 22nd November at the beginning of a non-stop trade wind passage to St Lucia. The Sailing Today article (last link) has a list of facts about this 30th year Celebration ARC Rally. 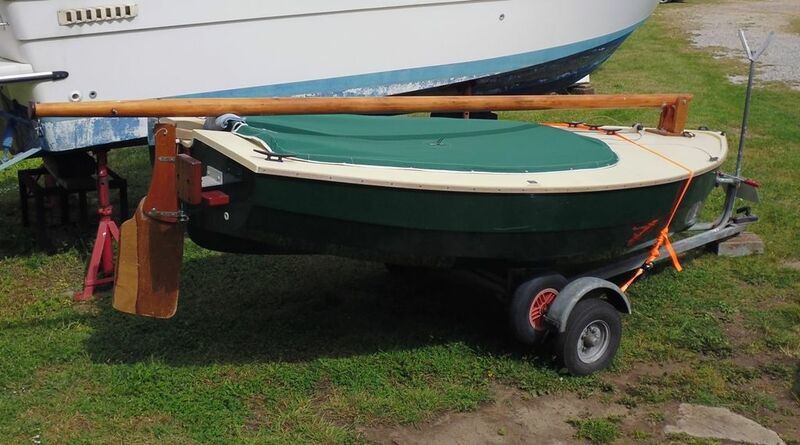 it is interesting to note the the smallest boat has an overall length of 32 feet, and the average length is 45 feet 8 inches. 1,116 people will be taking part, 32 of them children, 16 years of age and under. 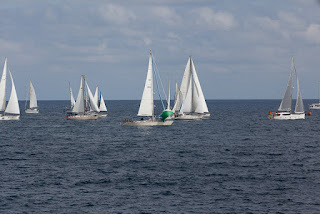 This sort of event is for gregarious sailors and perhaps the more heeled - very different in character and in spirit to the Jester Challenge* which is for solo sailors.